Suspended on steel aircraft cables, this breathtaking 12-light chandelier is crafted with polished nickel-finished hardware and outfitted with organic freeform handmade glass panels, individually made by master artisans. Illuminated by candelabra bulbs, this piece makes a bold statement above a dining table. Hardwired. 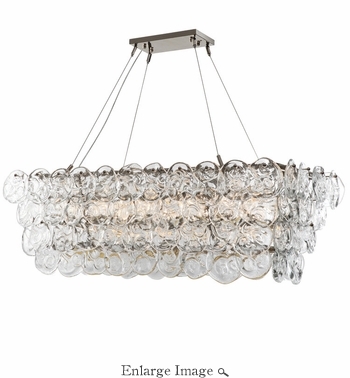 The Prelude Chandelier has 11 lamps and comes with clear free formed glass disk.